Product Measurement (cm) (LxW) 29 X 22 The Real Madrid Kit Lunch Bag is an official product manufactured under licence for Real Madrid FC. This has an insulated inside, ideal for keeping your lunch cool.The bag is designed in famous club colours with a kit shape and includes a zipper. The front features a large Real Madrid club crest. 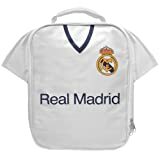 The Real Madrid Lunch Bag makes a great gift for any young Real Madrid fan and is ideal for packed lunches at school, at the match or on days out.